With many different deployment tools, options, and workflows available for today's IT admin, it can be hard to decide which one is right for their organization or particular project. Adam Codega, a Mac admin at Swipely, knows this firsthand. 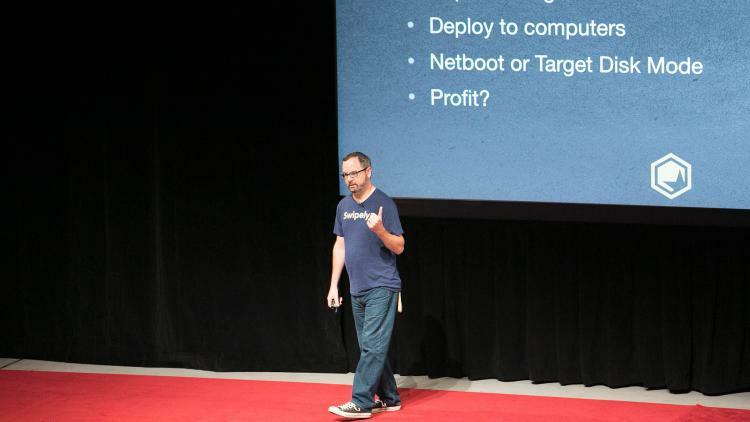 That's why he led a host of JAMF Nation User Conference (JNUC) attendees in a rousing discussion on 'why' to choose a certain deployment method instead of concentrating on 'how' to implement it. When Codega joined Swipley, a tech startup based in Providence, RI, he was tasked with wrangling their Macs. Swipely’s alternative work environment where employees each have a laptop and the opportunity to work in an open office space with lounge areas, couches and different rooms, helped him realize that he would need to choose a deployment method that makes the most sense with his dynamic work environment. Monolithic Imaging: Monolithic images have the OS and all the apps in one image. They are laborious to build and even more so to update. Monolithic may be beneficial in a lab, with very bandwidth intensive apps that you don't update very often. Modular Imaging: You combine a minimal OS image and build on top of it with a config to add easily updated apps from a distribution point. Thin Imaging: Similar to modular imaging, but installs items via policies after imaging. This is an efficient way to go because you don’t need to recreate your configs and policies. Device Enrollment Program: Codega shared that he currently uses Apple’s Device Enrollment Program (DEP) as the current method for deploying mac computers as Swipely. With DEP automatic MDM enrollment and provisioning, you set-up a management framework that is customized for each group of users. When a user is administered a brand new device, they walk through the setup process and all the configured settings and content will be put in place. Enrolling devices quickly and easily ensures that end users have access to services like Wi-Fi, email, apps, and content, while keeping your network and data secure. DEP is commonly referred to as “touch-less enrollment” because IT doesn’t have to touch a single box. Ultimately, Codega suggests “getting creative” and choosing the method that will work best for you and your goals. Join the deployment conversation at #JNUCDEP and find out how IT Pros are using DEP.